Then I Got To Thinking...: Rompers: yes, no? With what shoes? i wear them with all kinds of shoes but find that flats actually work best :) or mocs! I don't think I could ever pull off a romper, but I'm sure you look adorable in yours! 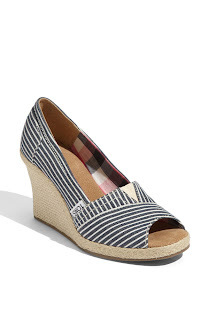 I think I'd lean toward the wedges (I'm short too, so I'll take any length I can get!). Can't wait for sun! Oh my I love your blog! Those first shoes (Born) with the flower, I have and they are BEYOND comfy. You should get them!!! Girlfriend we have the SAME TASTE!! It was MEANT TO BE (cue the running music and the birds hahaha) Wear them wedges! Especially for you because you a shrimpy :) Thank you for reminding me WHERE I found that blue one (forever 21! !haha ) I had plum forgot!! And I am obsessed with ModCloth!!! I bet you look SO fabulous in rompers! 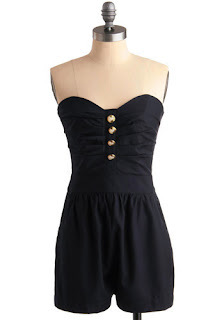 And I need to go stalk ModCloth bc um.. those are adorable! I have one and I'm 5'7 so I always feel too tall for them! haha! I think it's funny that you say you're too short for them. I wonder what the absolute ideal height is for these things! :) I am confident you look fabulous. And I think heels or flats go well, just not super tall heels. *shrugs* And all those shoes you posted are also pretty freaking adorable, girl! You=good taste! Girl, I love rompers! I think it depends when and where you are wearing them as to what shoes to wear. For during the day, flat sandals or wedges. At night you could wear wedges or higher heels. Pretty much anything goes as long as they go well together! Happy Monday!! I actually think rompers look cuter on petite girls! You would look adorable in them! 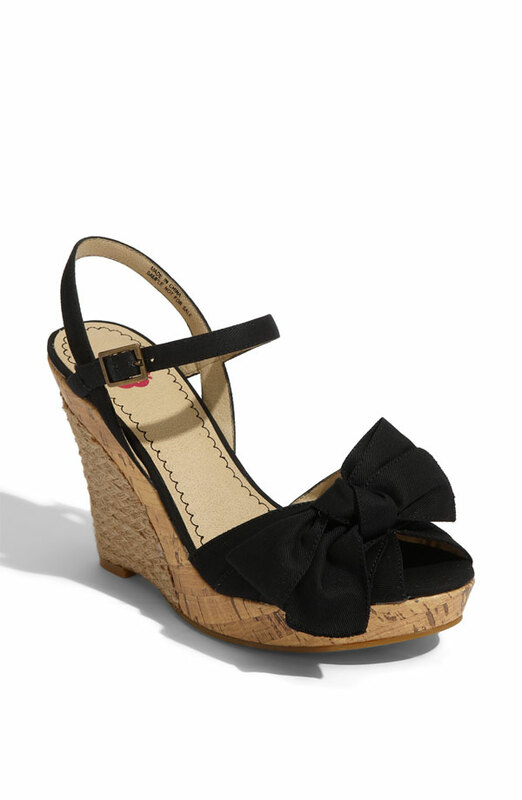 I love them with wedges for a more dressy look or flat sandals. A boyfriend cardi also looks cute over them in the evenings! Sadly I will have to keep my rompers packed away this summer... rompers and baby bumps DON'T mix LOL. OK i am glad i'm not the only romper-a-holic out there...i LOVE them, but in a weird way, ONLY with platforms...since shorts cut off the legs, i like them to look long and lean--HAHA!!! Ok, I used to hate rompers, but now I'm rethinking them. My sister loves them and she wears wedges, flats, and sandals with hers! I think YOU would look really good in rompers. Me? Not so much. :) I'm very hourglass-y shaped, and I have a feeling I'd look awful in them. 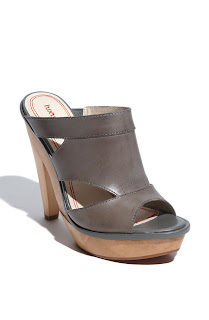 Though--those tan wedges just might need to come home with me. i have found myself being drawn to the rompers at target these past few months, but i cant figure out how i would wear them either! i still have no idea. i love those ones you posted from modcloth more than any i have ever seen! they make me want to try out the romper style. 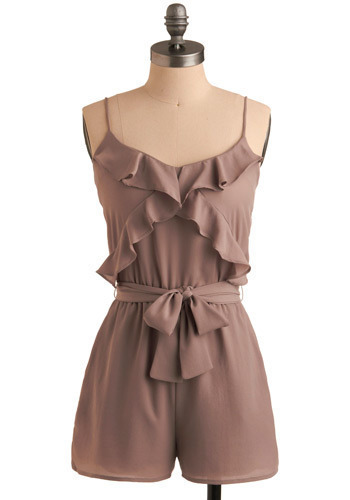 i think rompers are super cute although i don't own any. maybe i'll get one this spring! and i'm short so i'd wear it with wedges. 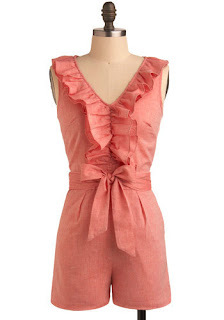 i love the peachy colored one with ruffles and a bow although i have no idea where i'd wear it. i'd probably get a more simple one...all depending on how it looked on me. I think rompers are adorable, but I think my torso is too long to wear them. That and the idea of going to the bathroom seems like quite a pain. New follower here! Yes, I love rompers though I've never tried one on! I think that they are so cute! I need to make a shopping trip! Those would look AMAZING on you with a pair of wedges!!! Definitely wear heels or wedges! They make rompers much more flattering on us short girls! I prefer wedges with the rompers. I do love them and I have a few, but I never seem to wear them much. I love all the above ones too and now I want more and summer! Oh my. I think I'm past the upper age limit of rompers. I think I'd look like an old lady in one. I love the ruffly one though! Cute. Go for it! I absolutely love rompers! I wear them with either wedges or sandals. That last one with the ruffles is my favorite... so cute! I went to Forever21 at the Galleria Mall on Saturday and they had one in almost every color, and super cheap! i think around $12! with cute lace the bottom! And i think depending on the print/style and etc of the romper, you should be able to wear sandals, wedges, heels & etc with them! I love to wear Rompers!!! I think they are so cute, fun and perfect for summer! I usually wear mine with cute flat sandals, but if you have the right wedges paired with the right kind of romper that look can definitely work too! You just have to be a little more careful when you're adding height via the wedge sandals. Love this look!!! Definitely try it!